In addition, it buys me a good hour or so, to focus on some important stuff (so this blogging thing is seriously more important than laundry, huh?! OF COURSE.) or just do whatever I want, while my children fuel their body with the energy they need for the rest of the day. With all these benefits, I’m sure everybody loves nap time. Who doesn’t, right? Apparently, my toddler feels otherwise. My son does take a nap every afternoon, but in his case, it sometimes takes a looooooong process. 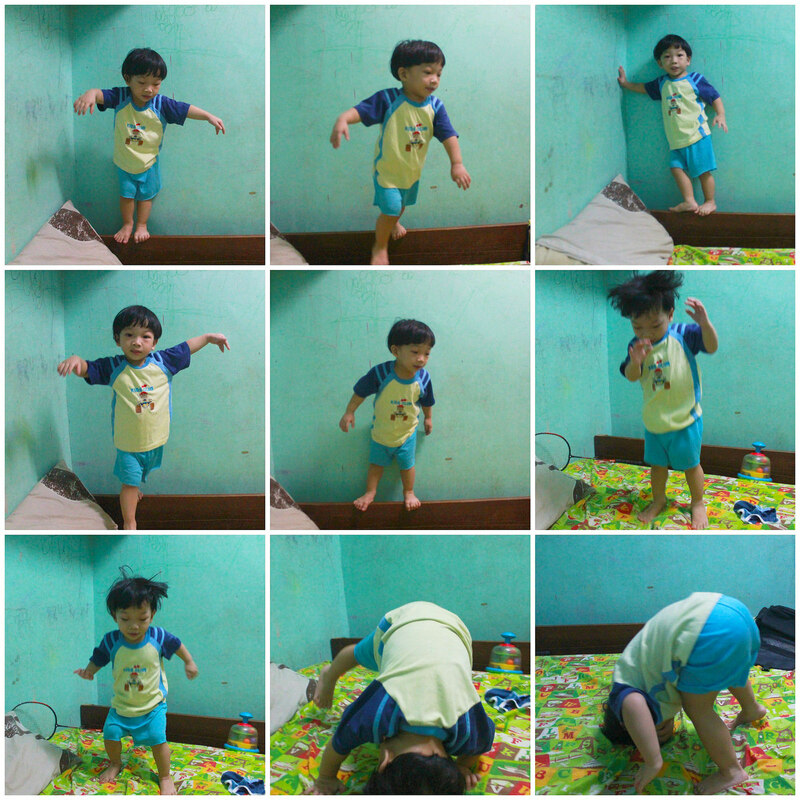 Here, let me share the 5 Stages of Toddler Nap Time, brought to you by my highly energetic 2-year old son, Zion. In this stage, I take Zion to bed and tell him that it’s time for a nap. Of course, he’d refuse and will negotiate that he has to take one “last” jump before sleeping. The last one will be followed by another “last” jump, and another one, and another, and…. you get it! There’s no such thing as “last” for toddlers! After he’s finally done with his last jump, he asks for his milk. He lies down and drinks for a few minutes, then hands it back to me, claiming he is done, which means he has consumed three-fourths of it. Yes, there is always about ¼ left which he refuses to finish. This time, since he is “done” with his milk (as he says), then it’s time for play. Instead of napping, he is now energized to play more. He will request for his ball, toy, drum, racket, pictures, etc, etc. Nap time seems to be a perfect time to play with everything at the same time.Then, he asks to play hide & seek and wrestle and tickle. Don’t I dare to say NO because he’ll burst into crying – which I’d rather save for the last stage. After I succeeded telling him enough of playtime, his next request will be one “last” water. Hmmm this is another negotiation which happens at least two times until I start using my “mad” voice and order him to go back to bed and take a nap. He finally settles down and asks for his pillow. It seems that he can’t sleep unless “Olaf” is on the side. Hmm but sometimes, any pillow will do. He just really makes random requests to delay his nap time. Reply	Pam / Hey, Miss Adventures! Haha. When the daughter doesn't seem too sleepy, we try to force her to sleep by sleeping ourselves. She often asks for milk before going for a nap but when she still stays up after that, we just sleep beside her and eventually, we find her lying somewhere in the bed beside us. The daughter sleeps more – and better – when we are on the road though. I agree, though there are times they just want to play more and skip sleeping. Hehe Thank you! nap time with my rowdy 5-year old is a luxury but i do get lucky from time to time. it used to be a source of frustration for me especially when i struggle to make him take his nap. he has a gazillion of alibis + one million and one ways to skive off naps altogether. I think kids are just like that. We need to tire them up for them to sleep! Kids have so many rituals. Lol! My son is turning 9, and he always finds an alibi each time I make him take an afternoon nap. Love your post momsie Rose- very true, kids nowadays got so much things to do in mind with so many distractions. Our little boy (8 yrs. old but still the baby) have so many diversions just to keep himself awake. Either chocloates or more chocolates which he learned keeps him alert but we are trying to keep him off chcoloates beacuse of caffeine. At his eraly age he discovered that choco can keep him awake. Thanks for sharing your story.